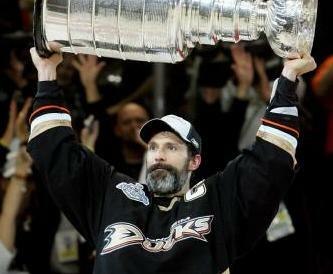 Bearded players have hoisted the Stanley Cup for three decades. Younger NHL fans who have grown accustomed to bearded Stanley Cup contestants can look back more than 25 years and see the New York Islanders were mostly bearded during their four-consecutive Stanley Cup-winning teams from 1980-83. But did the Islanders start a tradition or were they merely an oddity of their era? While the Islanders of the 1980s are generally credited with starting the tradition of NHL players growing beards during the playoffs, their tradition started almost a decade earlier, a player from a different team was first to wear a beard as he hoisted the Stanley Cup and no winning team for nearly a decade after the Islanders had a mostly bearded lineup. In fact, it appears that either the 1993 Montreal Canadiens or the 1995 New Jersey Devils resurrected the Islanders' tradition. Dave Lewis, the assistant coach of the Los Angeles Kings, joined the Islanders in their second season in 1973-74. The Islanders made the Stanley Cup Playoffs the next year, their third in the NHL. Lewis said that's when the tradition began. Well, that and another quickly abandoned "tradition." "I recall that playoff beards were an important part of every playoff we were in," Lewis said. "Part of the rationale was that it was a symbol that this was a different time, separate from the regular season. It was the championship season. It was also part of the unity of our team and I think we thought we probably looked a little more rugged with beards. "I remember my wife didn't like it. The other tradition we had was the elephant dung we carried around that year. We played the New York Rangers and beat them in three games. The circus was at Madison Square Garden and a friend of Billy Harris gathered some elephant dung, put it in a gunnysack and gave it to our trainers to put it into plastic bags. Then, we went down 3-0 to the Pittsburgh Penguins and came back to win the series in seven games, took four-straight games. "I don't know if we started playoff beards but we continued to do it in all the years that we were in the playoffs," said Hockey Hall of Famer Clark Gillies. "That went back to my rookie year, 1974-75, and I could barely grow a beard in 1974. Gord Lane could grow a beard overnight. If you didn't know it was Gordie, you'd think it was me if not for the numbers. Butch Goring had a scraggly beard that really completed his grungy look. John Tonelli had a great beard and Ken Morrow had one of the all-time beards. Kenny is the hairiest guy I've ever known. I think he shaved his face out of his body hair. "There were a couple of good reasons for playoff beards. You had less of a chance of getting cut up with a beard but if you got cut and needed stitches, a beard was hell," Gillies said. "You also get lazy about shaving when you're away from home and your wife for six weeks. I kept the beard when I played on Team Canada in the 1981 Canada Cup. I kept my beard after we won our first Stanley Cup and had it for a couple of years. It saved me from having to grow a playoff beard. "It turned out to be a tradition that has lasted for many, many years," Gillies said. "Now, you turn on TV during the Stanley Cup Playoffs and everyone has a beard. In our day, I think it was more of a superstition. If you were playing well, you didn't want to change anything. I know this is gross but it was the same thing with underwear. Some guys would wear the same clothes for six weeks if they kept on winning. Our coach, Al Arbour never said much about it but our wives didn't like it. "If we didn't start the tradition, I don't know who did. I don't remember them when I was playing juniors and watching the NHL." Gillies' memory is good. Most veteran hockey observers remember the late Cowboy Bill Flett wearing a beard year-round. 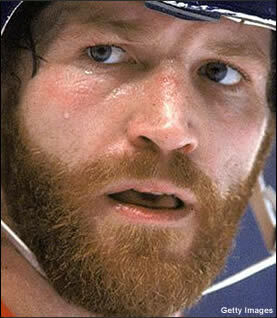 Flett was member of the 1974 Philadelphia Flyers who won the Stanley Cup, thus becoming the first player that people remember wearing a beard during a Stanley Cup celebration. Denis Potvin, the Hall of Fame defenseman who captained the Islanders to four consecutive Stanley Cups, was one of the founders of the "playoff beard." "Yeah, but he didn't just grow it for the playoffs," said teammate Gary Dornhoefer. "I never saw Bill without a beard and I can't recall anyone in the NHL wearing a beard before Bill. I think I had a beard during the playoffs one year but I don't remember which year. I don't like to shave. If I shave every day, my face gets raw. That year, I went a few days and thought I might as well go a little longer. Now, every player grows a beard unless he has a baby face. "I know I wore a beard against the Russians. There weren't many beards among my teammates which is funny because they can make you look mean." Edmonton native Ken Daneyko remembers the Oilers didn't wear beards because they didn't desire to continue a "tradition" started by the Islanders. The 1986 Montreal Canadiens and 1989 Calgary Flames didn't embrace the Islanders tradition, with the exception of the Flames' Lanny McDonald. The Pittsburgh Penguins were clean-shaven but there are pictures of Eric Desjardins and Ed Ronan bearded in the Montreal Canadiens' 1993 Stanley Cup Playoff photos. Nor were beards part of the Rangers' 1994 Stanley Cup. That old anti-Islanders thing, again. Daneyko believes his 1995 Stanley Cup champion New Jersey Devils resumed the tradition and he was a big part of it. "Edmonton didn't want to run with the Islanders' tradition thing and we started doing it in 1988 when we made the Playoffs for the first time," Daneyko said. "It was just one of those traditions or superstitions or whatever. We seemed to adopt it, most of the players. I liked doing it. One of the big reasons was the way it made me look. I looked in the mirror and thought, wow, I've got to clean up. I look like Grizzly Adams in the wilderness. My wife already knew I was old school but my kids said I looked old and angry. "I thought it was a good look for the playoffs, my grey beard and no teeth," Daneyko continued. "I was the poster boy for that kind of look. When I retired, I cleaned up and got some dental implants. You didn't think I was going to walk around looking like that for the rest of my life, did you? I've got no problem admitting it, I was getting pretty gruesome looking. "Now, it's a big tradition to grow a playoff beard. You know if your beard is long that you've gone a long way in the playoffs. Our teams would be rolling along and I was glad to be part of it. Some guys would go three or four weeks and couldn't stick it out because they couldn't get past the itch." "We grew beards every year that we were in the playoffs," recalls teammate Bruce Driver. "It started in 1988 and a lot of the guys started growing them the week before the playoffs. In some years, we started growing them before we clinched a playoff spot but that was part of the process of getting ready for the playoffs for most of the guys."